For more than 60 years P&M, whose well-designed motorcycles became known as Panthers in the early 1920s, provided sensible down-to-earth transport along with a surprising amount of innovation, particularly during the inter-war years. This is their story, with research and photographic material from the Mortons Archive. Renowned for decades for their tireless sidecar-lugging ability, the huge single-cylinder Panther slopers whose production ended in 1966 owed one basic aspect of their design – the use of the engine itself as a stressed frame member – to the very first motorcycle built by Joah C Phelon in Cleckheaton, Yorkshire, in 1900. The chain-driven pioneer also boasted a surface carburettor, automatic inlet valve and accumulator ignition. Vic Willoughby tries out the handling of a well set-up Panther combination. After his early business partner, Harry Rayner, was killed in a car crash, Phelon was approached by a young engineer named Richard Moore who wished to become associated with the enterprise, and the P&M partnership from which so much would stem started capital of £250 and just two workmen in 1904. Before the end of that year, their first joint patent appeared – a simple and reliable two-speed gear set-up, consisting of a double primary chain drive with different sizes of sprocket, and wedge-controlled expanding clutches for gear selection. It made P&M’s machines twice as useful on the hilly Yorkshire roads. The new two-speed gear and all-chain drive gave the marque a great advantage over the belt-driven single-speeders of their day, and Richard Moore was a regular and highly-successful competitor in the ACC (now Auto-Cycle Union) long-distance trials. Thanks to his two-speed gear, he alone could climb such hills as Birdlip, the terror of the Thousand Miles Trials, and as one after another of his perspiring fellow competitors failed at the steepest point, he would just quietly ride straight up, his feet planted firmly on the footboards that were fitted in place of the normal pedalling gear. P&M started the second decade of the 20th century with their time-honoured ‘3½’, whose 82 x 88mm bore and stroke side-valve engine, two-speed box and bottom-link forks had already built up a reputation as a sidecar machine. The range also included a ‘Colonial’ model of the ‘3½’ which had a 6in ground, clearance, and a 66 x 76mm ‘2½’ featuring Webb forks and automatic inlet valve. 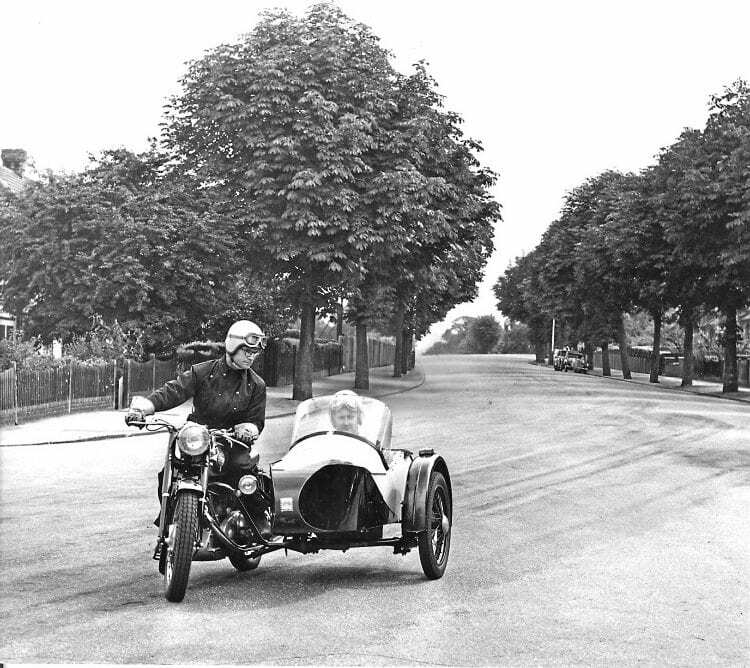 The ‘3½’ was gradually improved with a bigger engine and full chain enclosure, and a 770cc 90-degree V-twin, whose front cylinder replaced the downtube in the normal P&M manner, had also been designed by Richard Moore as a luxury sidecar machine. Sadly, few were ever sold as the First World War intervened, and with the Royal Flying Corps adopting the ‘3½’ as its official machine, the firm spent the duration of the conflict building the single-cylinder machines. In fact P&M’s became the only factory to remain exclusively on motorcycle production throughout. The inter-war years proved a great period for innovation, and a four-speed 555cc ‘4 ½’ became the first model to use the Panther name in 1923. The following year it was redesigned by Granville Bradshaw as a 499cc overhead-valve engine with an 84 x 90mm bore and stroke, with oil contained in an extension of the sump and a four-speed countershaft gearbox. The faithful old side-valve was finally discontinued in 1926, but the new machine sired a long list of big singles renowned for their power and silence as well as their virtues as the perfect sidecar machines. During these vintage years there was a regular P&M entry in the Senior TT, with C T Ashby, Tommy Bullus and W S Braidwood among the better-known riders. Bullus finished fourth behind Alec Bennett’s Norton in the 1925 Senior, and the Senior TT edition of 1927, with its functional lines and short saddle tank in two shades of green must have been the best-looking machine ever to leave Cleckheaton. During that same year Panther really broke away from tradition with a sensational little Granville Bradshaw-designed 250cc transverse V-twin called the Panthette. The unit-construction engine, total enclosure and unique frame were all completely unconventional, and when it finally went into production at around £50 it had good looks as well as promise. By 1929 you could have a 596cc version of the big single with a guaranteed top speed of 85mph, and the firm faced up to the slump with a range of 147cc, 196cc and 248cc Villiers-engined jobs in the little Panthette frame. A maroon-finished 248cc base model with a forward-inclined engine and oil contained in the sump, but it had a front downtube separate from the cylinder and quickly became known as the Red Panther. At a bargain-basement price of just £27 17s 6d, it was soon selling like hot cakes through a well-known London agent who also offered a £5 deposit, easy payment deal. Despite its humble origins, the Red Panther was reliable and long-lived, and there was a 350cc version as well. Much more interesting development work was going on when the Second World War intervened in 1939, but this time the works were reorganised to produce aircraft parts. After the war the pre-1939 range came back with Dowty telescopic forks, and in 1949 the 250cc and 350cc engines were redesigned to sit in an upright position. In 1952 a new polychromatic blue finish appeared on the 250cc Model 65 and 350cc Model 75, and silver grey on the Model 100, whose appeal, especially to sidecar enthusiasts, just went on and on. In the Coronation year of 1953, the small singles acquired swinging arm rear springing and Panther’s own telescopic front forks, and in 1954 a new heavyweight telescopic front fork was developed for the big single, together with swinging arm rear suspension. With the launch of new three and four-speed 197cc lightweights in 1956, the old association with Villiers was revived, and the following year a 250cc version using a Villiers twin was introduced, both using the maroon finish of the smaller pre-war models. Panther also brought out its own scooter, known as the Princess, but sadly this was not a success and must have played its part in the firm’s demise. The receiver was called in 1962 but Panther battled on for another four years but by then the end was inevitable. The Villiers-engined 197cc singles continued in production until 1960, the 350cc Model 75 until 1962, the Villiers twin-engined Model 45 until 1964 and the Villiers twin-engined 250cc and 650cc Model 120 sloper until 1966.